Discrimination hurts real people. 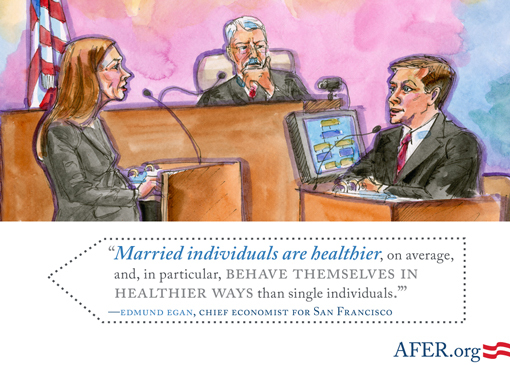 To demonstrate the effects marriage has on local economies, the plaintiffs called Dr. Edmund Egan to the stand. Dr. Egan is the chief economist for the City and County of San Francisco. He explained how state and local governments receive greater economic benefits from marriage than from domestic partnership. He also explained how San Francisco has lost and continues to lose money as a result of the inequality imposed by Proposition 8. 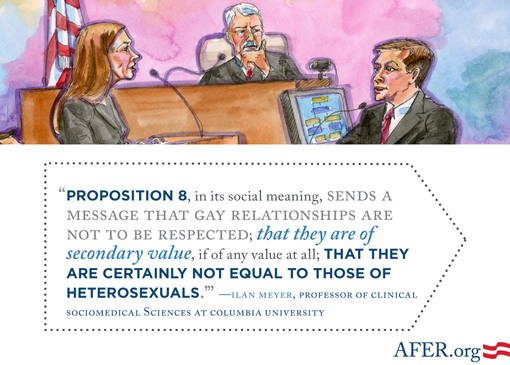 Then, social epidemiologist Ilan Meyer testified about the harm gays and lesbians have experienced because of Proposition 8. At the time of trial, Meyer was a Professor of Clinical Sociomedical Sciences and Deputy Chair for MPH Programs at the Department of Sociomedical Sciences at Columbia University’s Mailman School of Public Health. Jesse Tyler Ferguson recreated parts of Dr. Meyer’s testimony at the “8″ Los Angeles Premiere.